Yes I know that isn’t a real word. I’ve been participating in Frizztext’s A-Z archive photo challenge for many weeks now and I have to admit I’ve been dreading the letter X. Maybe I’m just not feeling my creative juices today, but all I could think of was Xcited. When I attended my first football match in England I was super excited. 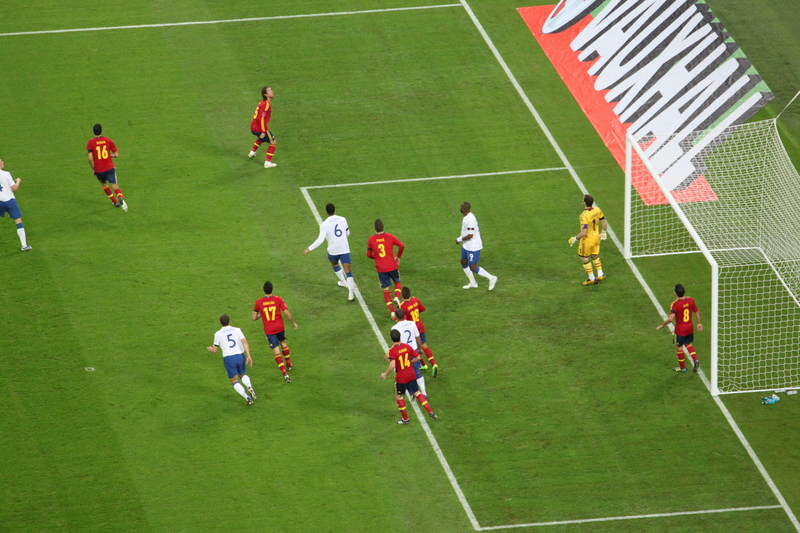 If you look at the photo of the England v Spain match below you will see a Spanish player (red jersey) near the goal. His name is Xavi. Does that help? This entry was posted in A-Z Photo Archive and tagged A-Z Archive, England, Football, Photography, Soccer, Spain, Sports. Bookmark the permalink. 28 Responses to X is for Xcited! You are right…I didn’t see a lot of options. Usually with these challenges I try to choose photos that I think are fun. This one I was like, well it is a stretch but oh well. I’m the opposite, I’m a huge soccer fan. But I hope to get to more rugby games this year, which I think is one of your faves. I’ll keep an eye out for it! I wish I could go in person. I love SA! If X can be Xmas, why not Xcited? 🙂 Cool entry! Me thinks you have met the challenge, TBM! And they say cheaters never prosper. Well there you are. The letter x challenge is over. Thanks goodness. I loved your X. Well, what else you going to do? Post an x-ray! Or a picture of an x-man (mmm, Wolverine *wiggles eyebrows*). Oh I wish I had a picture of Wolverine. Alas, my photo collection isn’t that exciting. Thanks Lynn. How Xciting!! X was definitely a challenging one, but xcited works for me! I loved your desert plant. I’m not the best at remembering all of their names either. And this week’s challenge was made for you! X is always a hard one, but I think you did a good job! Thanks…now I don’t have to worry about it anymore. Thanks…now I need to think about Y.